Early August 2017, I received a shaky leaf hint on Ancestry.com, alerting me to a military record. Note: The shaky leaf is an indicator that lets the user know that there is a possible record that may be a match to a person in your tree that is displaying the leaf. This leaf led me to a U.S. Civil War Pension index record for a Henry King. Henry was a known relative on whom I had completed some research and included in my family tree. 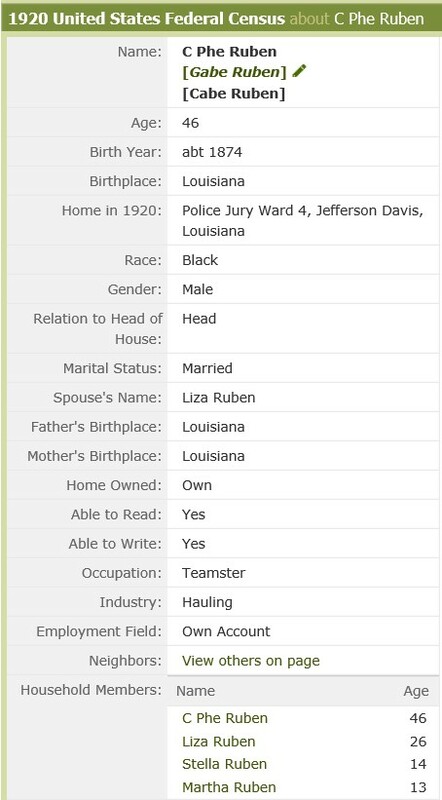 The US 1870 census indicates that 30-year old Henry King lived in Opelousas, Louisiana with his wife, 25-year old Isabella and several others who I know are his sisters. Living next door are Henry’s parents, Warren King and his mother, Temperance (Tempy). Tempy is the sister of my 3rd great-grandfather, Moses Jason, and the daughter of my 4th great-grandfather, Godfrey Jason. In my last post[“Mama, it was true! Your Daddy was in World War I!” ], I discovered that my Grandfather, Alsen Jason I had been in World World I. This was a significant finding in my genealogical research, as it had been one of my mother’s questions for me when I started tracing my ancestry. On this Memorial Day, I thought it would be good to share some newly found details. As I mentioned in my previous post, I submitted a request for my grandfather’s military records. Years ago, I had submitted a request, but the results of the search showed that he was not in the War. Now, after I actually found the correct Louisiana World War I Services listing, I was able to provide the alternative spelling of my grandfather’s name, which was used during his service. Calling All Loftons (Loftins)! Do you know my Grandmother’s People? I continue to struggle getting back to posting in my blog. On February 13th, almost five months after the death of my mother, my eldest sister Irma Marie Frank passed. Needless to say, her death has also left me devastated. 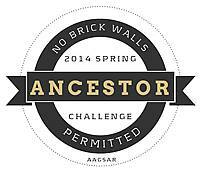 Like my mother, my sister was a big proponent of my genealogical research. I’m so happy that I followed my gut and had both of them take DNA tests before their passing. Maybe it will be their DNA that will ultimately lead me to my grandmother’s maternal line. 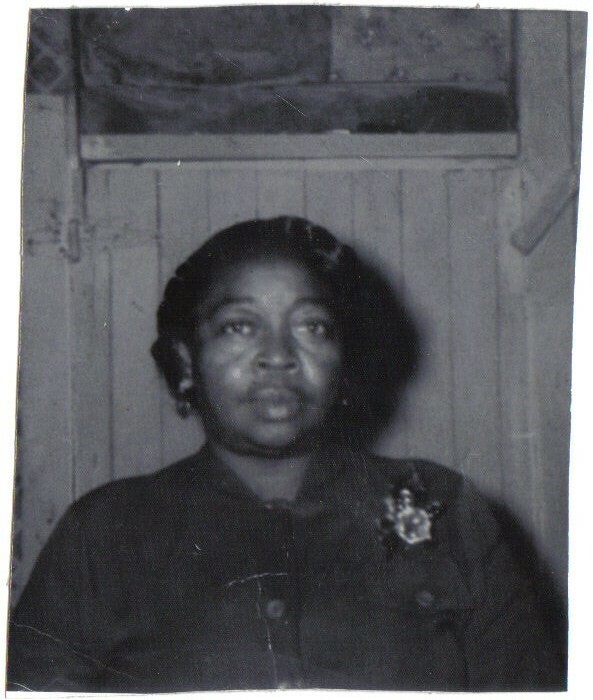 Since my last post, I have received one additional hint about the identity of my maternal great-grandmother. For those of you that use ancestry.com for your family research, you may be aware that in 2015 Ancestry.com, added a searchable database that I found to be extremely useful. Last year, Ancestry.com added an addition to their Social Security Death Index (SSDI): U.S., Social Security Applications and Claims Index. This database provides more details about social security applicants, which may include their full name (including applicable maiden name), birth data, and place of birth. However, the most important information I’ve found in the database are the names of the applicant’s parents. As you may recall from my last post, I found my grandmother Estella Rubin’s mother’s name on a marriage license, which was listed as Eva Laughtin. I wasn’t sure if the Laugh had a “Law”sound such as Lawton or a “Loff” sound like in the name Lofton, but at least I had a name. From the application, looks like my grandmother listed her mother as Evil Loffton. Do you have any other ideas what the mother’s name in the document? Maybe the name is Evie Lofton? I’m not familiar with any Loftons. Do you know any Loftons out of Mowata in Saint Landry parish in the great state of Louisiana? Hit me up with any information you can share on this subject. Where Are You, My Grandmother’s People? After my last post, I had to take a break from writing. I was too high from my last find and I didn’t know where to go for my next blog post. So, over the last month I’ve decided I’m ready to continue the adventure. Let me start be saying this is a mystery and I need help! Growing up, I remember my Mother making comments about her mother, Estella Ruben, who we called Momí Stella. Unlike other people who have a hard time getting information for their elder relatives, my mother has never had any problem sharing. She always was willing to share family lore, often unsolicited. My mother was known for telling these enthralling stories—well, at least they were enthralling to me. “Momí Stella used to drink? I had no idea. Man, I would have never known that.” My grandmother lived a pretty wholesome life from my point of view – I never saw her drink. While cooking one day, my mother told me “Momma didn’t know her mother—not even her own mother’s name.” From my mother I learned that Momí Stella’s mother died shortly after she was born. My mother Momma said “my grandmother had other children and after she died, my grandfather, Gabe, sent her other children back to Mowata to live with my grandmother’s family”. My grandmother died in 1974. According to my Mother, before Momí Stella’s death, she had attempted to try to find her siblings. She wasn’t successful and we, at this point, don’t have any leads to finding this part of my family. My grandmother did not even have a birth certificate. On her death certificate, her mother is listed as unknown. Once I started being serious about genealogy, I knew this was one of the family mysteries I wanted to solve. Over the years, my mother would repeat this story from time to time. She would also ask if I had found any information yet on Momí’s missing siblings. Bringing back together this long-ago torn family and enabling my mother to connect with aunts, uncles, their children, their children’s children is one of my greatest prayers. Maybe someone reading this blog post can help me. So, let me sort out the information I do know about my grandmother’s family. Born July 9th, 1905 in Elton, Louisiana, Estella Ruben, was the daughter of Gabriel “Gabe” Ruben. 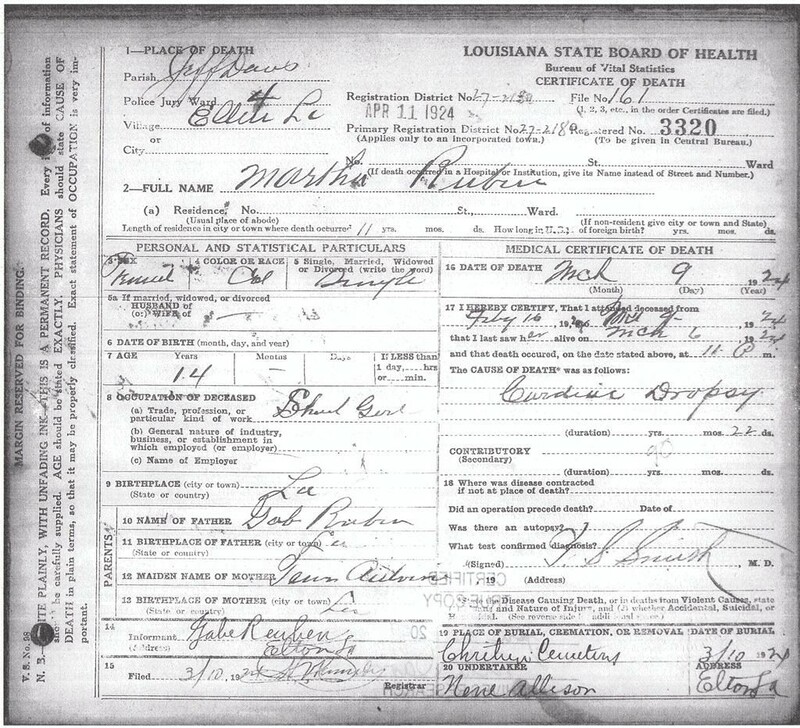 Gabe, per his death certificate, was born in Ville Platte, Louisiana in 1876. 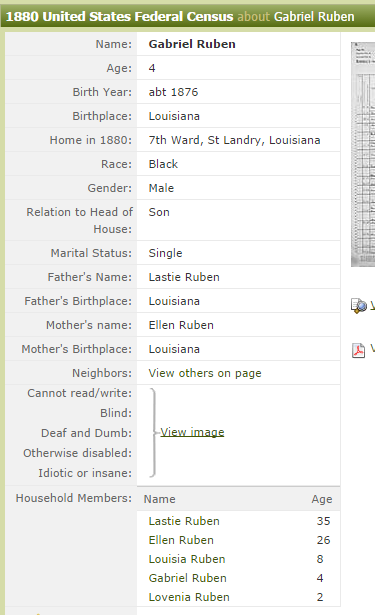 On the 1880 census, I found Gabriel listed as the 4-year son of Lastie and Ellen Ruben. Also listed are Gabriel’s sisters, 8-year Louisa and 2-year Lovenia. As I continued to look at census records, genealogy enthusiasts know that most of the 1890 US census records were by a fire, so the 1900 census are the next set of records available. Unfortunately, I’ve not yet been able to find Gabriel in the 1900 records. On the 1910 census, I not only picked up the trail of Gabe, it also is the first census on which I find my grandmother [E]stella. So at the time the census was taken, April 1910, Estella is noted as being 4 years old, which means she would be 5 on her next birthday of July 9th. As, mentioned earlier, Momí Stella did not have a birth certificate so 1905 could be accurate, although her obituary listed her birth year as 1906. The census shows that Gabe and his wife, Eliza, have been married for 5 years and that Eliza had given birth to one child who is alive at the time of the census. Finding, Gabe, Eliza, and Estella on the 1910 census made me think I had not only found my grandmother, Estella, but I had possibly found her mother, Eliza. That seemed to be the only conclusion. Then, what of the story about the death of my great-grandmother and her children being sent to Mowata? Was that just a myth? My grandmother had a younger sister named Martha Ruben. On the 1920, Martha, 13, along with my grandmother [E]stella, 14, are both shown with Gabe and Eliza. If Martha is only a year younger than Estella, why isn’t she on the 1910 census in Gabe’s household? Tragically, Martha dies almost 4 years later of cardiac dropsy, which is edema due to congestive heart failure. At the time of her death, the death certificate says she was 14, giving her a birth year of around 1910. Martha’s mother’s name is illegible on the document and I’ve been unsuccessful in making out the full name. The last name looks to me to be “Antwine”. What do you think is the name? So maybe Eliza is the birth mother of Momí Stella, but I don’t think so. At the age of 14, my grandmother would have known the person listed as Liza on the 1920 census. Assuming Liza is the same as the Eliza that is on the 1910 census, it is unlikely my grandmother would have said that she did not know her mother if in fact Liza (and Eliza) was her mother, right? There’s also a discrepancy with the age of Martha. The 1920 census, it has that she is 13, which means that she was born around 1907. However, her death certificate have that she was 14 when she died in 1924, means that her birth date was about 1910. 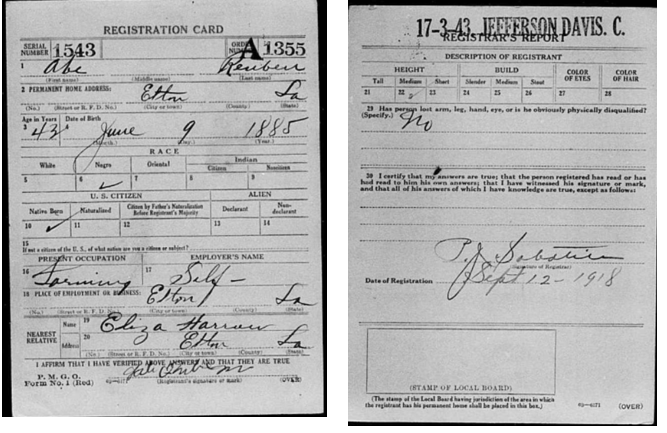 On a World War I draft registration dated September 12, 1918 I found Gabe’s significant other as Eliza Harrow. The trail ends and I still have no information on who could be the mother of Momí Stella. I welcome your ideas on where I should look next to try to solve this mystery.